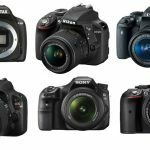 These are digital cameras that are technically equipped to withstand working in wet surroundings (even underwater up to a certain depth) but also in other demanding situations that include dust, very low (or high) temperatures as well as falling from a certain height. These are usually great for filming sports, but ultimately can be used for anything near some type of water, even if you want some protection just in case (such as a vacation, out at the beach, etc.). They also have a pretty high megapixel count as well as decent-quality build-in sensor for taking high-quality photos, and many also come with the option for filming videos on top of it. 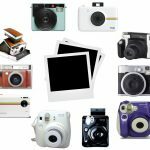 Unfortunately, none of the popular DSLR cameras or mirrorless cameras come in waterproof (most in here are digital point-and-shoot cameras). 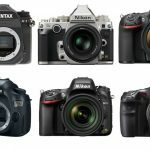 Budget – These cameras aren’t too expensive if you’re using DSLR’s or mirrorless cameras as your basis of measurement. 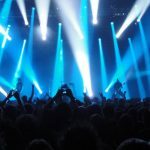 The higher you go, typically the higher quality photos and overall build the camera will be (megapixels are important for the quality of your pictures). Do you want video? Quite a few of the best out there provide the ability to not only shoot near\underwater but also film video if needed. If you are indeed looking for some video capability, we recommend going with at least Full HD 1080p (none quite go up to 4k video resolution yet). Many of these come with video already so you’ll be good go to go, but if it’s a complete must for you, double-check before purchasing. We’ll let you know if the particular camera does. Other types of protection? We’ve seen many others in here with not only our desired waterproof, but dust proof, shockproof, and some even freeze proof. This will also boil down to your intended applications of the camera — will your foreseeable environment\conditions ask for some more protection? How about just in case? If you are looking for a durable, rugged and relatively affordable camera for taking photos and shooting videos in all types of environments and conditions, then the Olympus Tough TG-4 we feel is definitely one of the best waterproof camera options in the market today. It’s made an appearance in almost all of the other popular internet lists aside from ours. It is equipped with some pretty advanced features, such as RAW capture, microscope modes, an F2.0 wide-angle zoom lens, and even nighttime live composite for some low-light environment shooting. The entire build is one of the most stable we’ve seen when it comes to overall ruggedness of cameras, and combined with the built-in tech will enable some great capturing under water, in the rain, storm, etc. It is a 16 MP camera that is also dustproof and the waterproofing goes up to 15 m. It can withstand a fall from about 2.1 m and can function in freezing -10 degrees Celsius in case you want to take it to the snow or colder settings. Additionally, it is equipped with Wi-Fi so that you can instantly share your perfect photos with friends online. 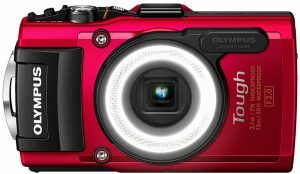 We felt like listing the Olympus Tough TG-4 first because of it’s appeal to all-around camera users, particularly those seeking some stable waterproof capability to make sure it’s safe. 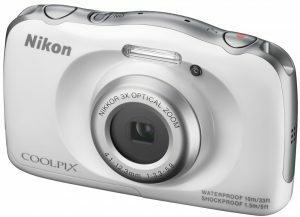 Up next, we have another one of our favorite picks as the best waterproof camera, and this one is a very popular model although Nikon’s entire COOLPIX line is worth looking at (we have another listed later on). This is a waterproof, dustproof, freeze proof and shockproof camera with a decent-sized 13.2 MP CMOS Sensor (pretty amazing considering the price) to take clear photos and film full HD 1080p videos if you’re in the mood. A big plus is it is easy and simple to use thanks to its large buttons and simple menu. Being one of the best waterproof camera models out there, it comes with a 3-times wide-angle optical zoom and 6-times dynamic fine zoom for improved digital zoom that will drastically sharpen and enlarge the image you are taking. This camera comes with loads of additional features for creative shooting, with a few highlights including image effects (miniature, selective color, etc. ), motion detection to choose higher shutter speed, etc. The Nikon COOLPIX S33 is a very highly reviewed and rated waterproof camera that’s been around for a while now, and is a solid option if you’re on a relatively strict budget. 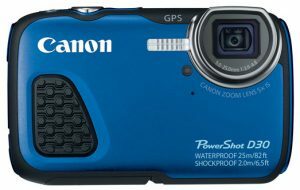 The Canon PowerShot D30 is a another one of the best waterproof cameras, and it gives us some additional protection like the others: dust proof, shock proof and freeze proof (why not?). It comes with 12.1 MP CMOS Sensor well as a solid DIGIC 4 image processor that will improve image quality especially underwater. The sensor and processor aren’t as beastly as some others out there, but you’re getting what you pay for, especially within this price-point. When you want to film some videos, there is 1080p Full HD quality here for an excellent experience. Like the previous COOLPIX competitor, this waterproof camera is equipped with large buttons and a simple menu for easy usage. Another thing that separates the Canon PowerShot D30 from the competition and definitely makes it one of the best waterproof cameras on the market is the fact that it is equipped with a 5x zoom lens with a focal length range of 28-140 mm to deliver a wide variety of perspectives on top of the easy use it brings us. This here is shock proof, waterproof, dust proof and freeze proof along with 16 MP for taking very high-quality photos and full HD 1080 p videos. With its large 3.0″ LCD display and simple, easy to use menu, it will really enable you to create excellent images no matter where you are. The 5-time optical zoom is especially great for those concerned with their image quality can be further improved, so you can catch even the smallest details. Use the built-in Wi-Fi feature to download the photos and share them with your friends online pretty easily. When comparing it to the previous picks, there isn’t much that stands out but it does hold up to par with the average specs list. 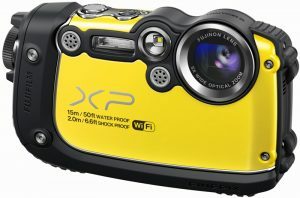 If you are looking for one of the best waterproof camera options out there and weren’t feeling the others, don’t forget to check out the Fujifilm FinePix XP200, one of the best waterproof cameras designed to function in not only that pesky H2O but also other extreme conditions you may face during your adventures. The Panasonic DMC-TS6 is thought by many to also be one of the best waterproof cameras in the market thanks to its quality-to-price ratio with some impressive features, such as the 16 MP MOS Sensor that is highly sensitive, a 4.6-times Leica Zoom Lens and large 3″ LCD Display. Like many of the previous models listed thus far, this is not only waterproof but shock proof, freeze proof and dust proof as well. As recommended for those in need of a video camera, you’ve got the standard HD 1080p videos alongside of it. The camera is also equipped with some more rare and innovative features such as geo-tagging so that you can attach the location to your photos, as well as built-in Wi-Fi and NFC connectivity to can share your photos and videos on social media instead of uploading them to your computer first. If those additional features peak your interest and you feel the price-point fits within your budget, you can’t go wrong with the Panasonic DMC-TS6. The color options are pretty cool, too. Here’s one of the only best waterproof cameras with interchangeable lenses you’ll be able to find in the market. Aside from being like the others as waterproof, freeze proof, shockproof and dust proof, you’re also equipped with a 14.2 MP high sensitivity sensor and 1080p video (full HD). It will give you some beautiful, clear images even when you are on the go. This camera comes with a built-in GPS for geo-tagging of your photos and videos while out and about and the shutter button will enable shooting up to 15 frames per second for high-quality, interesting continuous photos; features such as Live Image Control and Slow View will further spice up shooting. Even though that MP isn’t as high as the others, the fact that you’re able to swap out lenses really takes your photography to another level when it comes to custom look and feel of what you’re capturing. 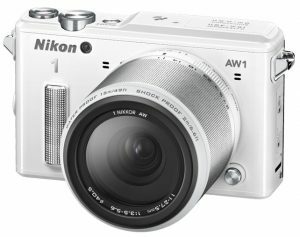 The Nikon 1 AW1 is one of the nicest we’ve seen thus far in our many years of camera research, especially for a camera that is waterproof — it’s as close as you’ll be getting to a semi-pro mirrorless or DSLR-like model right now. Here’s another COOLPIX waterproof camera that’s way too popular not to include early in this top 10 guide. This is a bit more of a pricier model with a wide-angle, 5-times optical zoom and 10-times dynamic zoom that will take some high quality images as well as full HD videos. With the built-in Wi-Fi and NFC, you can instantly share your photos and videos online instead of using your computer as the middle-man. This camera is also equipped with the option to geo-tag your photos, while the unique Points of Interest (POI) feature enables you to detect interesting photographic locations nearby for you to shoot with your ultimate waterproof camera. The shutter button allows shooting in sequences while taking up to 5 photos per second (many people love this if you haven’t tried it yet). 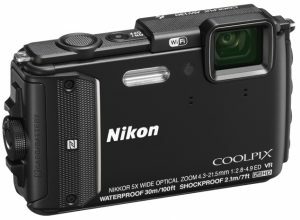 If you are looking for a high-end camera that is waterproof, dust proof, shock proof and freeze proof, the Nikon COOLPIX AW130 is definitely one of the best cameras with waterproof protection out there. We just hope you have the budget (who knows, you may want to save up for this to take a step up as to what you were previously looking for). 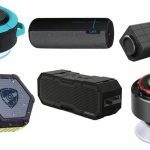 This camera with waterproof protection is a bit higher when it comes to price-point as compared to many others in this guide, but it may very well be worth the investment if you have the cash handy. It is waterproof, shockproof, dustproof as well as the bit more rare freeze proof. These types of protection as well as the tank-like build really make this one an excellent companion if you are looking for a camera that will reliably serve you in numerous types of environments. When it comes to technical specs, it has 16 MP, a CMOS sensor and an HD 1080p video shooting option that will enable you to shoot photos and film videos in a wide variety of conditions. 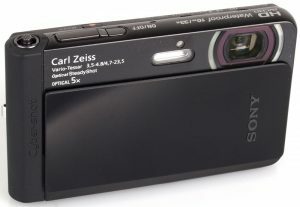 For zoom, it comes with a built-in 4-times optical zoom as well as the option to shoot in sequence for up to 30 frames. It is also equipped with a feature for the reduction of shaking, which will allow you to take some clean photos even when you are on the move. 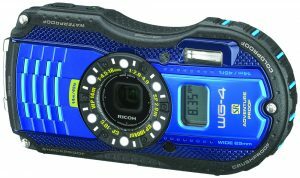 The Ricoh WG-4 should be considered if you wanted one of the most rugged cameras in here and have the money. If you were looking for the highest megapixel count alone as well as the best waterproof camera that had some the most advanced technology in here, check this one out. It comes with an 18.2­ MP highly sensitive CMOS sensor and OLED screen for crystal clear photos as well as Full HD videos. The well-known, powerful Carl Zeiss wide-angle lens delivers 5x optical zoom that combined with the built-in LED lamp enables very detailed close shots. The DSC-TX30 is also freeze proof, dust proof and shock proof and the shutter button enables taking up to 30 shots per second. For some extras that my appeal to some, this is a model that will allow you to play with the photos with numerous creative effects (such as retro, sepia, monochrome, etc. ), and its optical image stabilization will enable you to take great photos and videos while on the move (depending on how shaky it really is, you may need some post-production stabilization as well). The Sony Cyber-Shot DSC-TX30 is definitely one of the best high-end waterproof camera options in the market due to its numerous technical capabilities. This isn’t for beginners. 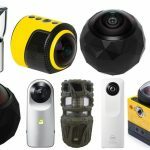 To top off our list of the best waterproof cameras, we have quite a different spin as compared the others in this guide, but felt it necessary to at least include here for those who have reached this far in our list. If you haven’t heard of GoPro cameras, you’ve most likely seen their point-of-view videos here and there through out your time in society at least once in the last 7-8 years. 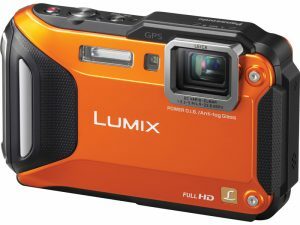 This is both a traditional waterproof picture-taking camera as well as a video camera that still remains popular today. Here are some of the highlight specs: built-in touch display, 1080p (60 fps) videos, 12 MP (30 fps) pictures, Wi-Fi and Bluetooth support, a GoPro app to sync with (one of our favorite features), and more. You’ll need to buy some separate mounts (it does come with a few of the most popular in the box) so keep that in mind as well. 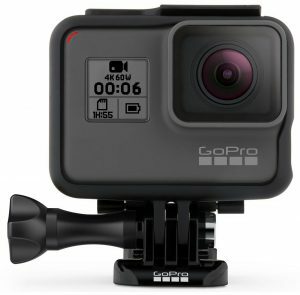 It’s not like the others, but check out the GoPro HERO since we think many of you will love it if you don’t have one already (it’s one of their many cameras available, but in the middle so we chose it — just make sure the model you’re checking out is waterproof because not all of them are). Of course, these features will differ depending which model you grab. Make sure the housing is waterproof.